Volume imperfections, e.g. cracks may arise when there is only small electrostatic dissimilarity between the stacking sequences of close packed planes in metals. Moreover, when clusters of atoms are missing, a large vacancy or void is got which is also a volume imperfection. Foreign particle inclusions, large voids or non-crystalline regions which have the dimensions of the order of 0.20 nm are also termed volume imperfections. Bulk or volume defects are normally introduced during processing and fabrication steps. 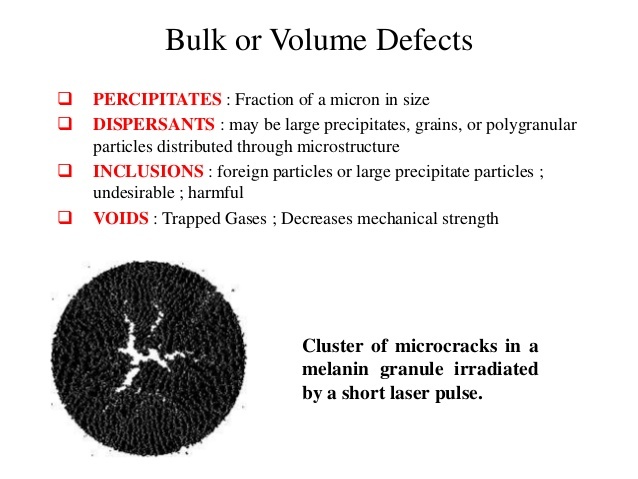 Volume or Bulk defects includes pores, cracks, foreign inclusion, and other phases. Note: A color centre is lattice defect that absorbs visible light. The usual place to find color centre is in ionic crystals.